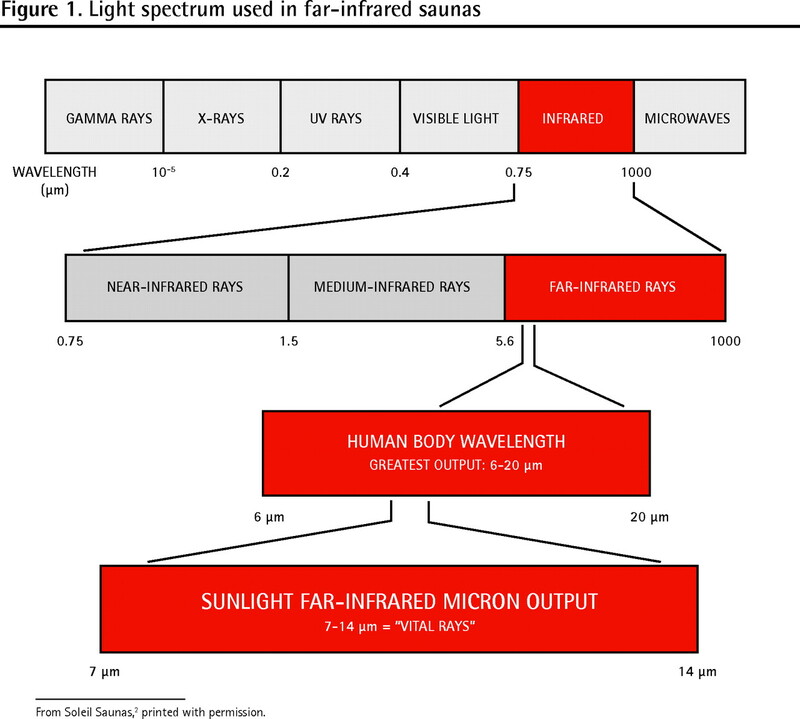 OBJECTIVE To review the literature about the health benefits of far-infrared sauna (FIRS) use. QUALITY OF EVIDENCE A search of Web of Science, EBSCO, Ovid MEDLINE, Ovid HealthSTAR, and EMBASE using the terms far-infrared and sauna, refined by limiting the search to studies of humans published in English, yielded 9 relevant papers (level I or level II evidence). MAIN MESSAGE Far-infrared saunas are approved by the Canadian Standards Association and are sold to the public. The manufacturers claim numerous health benefits; however, the published evidence to substantiate these claims is limited. Four papers support the use of FIRS therapy for those with congestive heart failure and 5 papers support its use for those with coronary risk factors. CONCLUSION There is limited moderate evidence supporting FIRS efficacy in normalizing blood pressure and treating congestive heart failure; fair evidence, from a single study, supporting FIRS therapy in chronic pain; weak evidence, from a single study, supporting FIRS therapy in chronic fatigue syndrome; weak evidence, from a single study, supporting FIRS therapy for obesity; and consistent fair evidence to refute claims regarding the role of FIRSs in cholesterol reduction. Far-infrared saunas (FIRSs) are approved by the Canadian Standards Association and are sold to the public as recreational saunas. Manufacturers advertise numerous therapeutic effects, including weight loss, improved cardiovascular health, normalized blood pressure (BP), lowered cholesterol, and reduced pain, stress, and fatigue.1 These saunas are also being advertised in publications targeting Canadian physicians.1 The current North American market for FIRSs is valuated at approximately $60 million to $75 million and is growing rapidly, according to Aaron Zack, President and Chief Executive Officer of Sunlight Saunas (written communication, May 2009). Traditional saunas use either wood stoves or 220-V heaters to heat the air to approximately 85°C, which then heats the occupant, mainly via convection. Some people find this heat uncomfortable. In contrast, FIRSs heat to approximately 60°C, providing a more comfortable and relaxing experience. They utilize 120-V infrared elements, similar to the infrared warmers on neonatal resuscitation beds, to radiate heat with a wavelength of around 10 μm (Figure 12). As infrared heat penetrates more deeply than warmed air, users develop a more vigorous sweat at a lower temperature than they would in traditional saunas. The cardiovascular demand imparted by thermoregulatory homeostasis (sweating, vasodilation, decreased afterload, increased heart rate, increased cardiac output) is similar to that achieved by walking at a moderate pace. As such, FIRS might be of particular benefit to those who are sedentary due to various medical conditions, such as osteoarthritis or cardiovascular or respiratory problems. This paper seeks to review and summarize the published data on cardiovascular benefits of FIRS use. The implications will be of substantial interest to health care providers, patients, manufacturers, regulatory agencies, and consumers. A search of Web of Science, EBSCO, Ovid MEDLINE, Ovid HealthSTAR, and EMBASE using far-infrared and sauna was refined by limiting the search to human clinical therapeutic studies published in English. Only clinical therapeutic trials of level I (randomized controlled trials [RCTs]) or level II (cohort and non-randomized trials) evidence (Table 13–11) were included in this analysis. In one RCT3 (level I evidence), 30 subjects with New York Heart Association (NYHA) class II or III CHF and more than 200 premature ventricular contractions (PVCs) per 24 hours were randomized into treatment and nontreatment groups. Treatment consisted of 10, 15-minute infrared sauna sessions over a 2-week period. After 2 weeks the sauna group had significantly fewer PVCs (mean [SD] = 848  vs 3097  per 24 hours, P < .01) and lower brain natriuretic peptide (BNP) levels (mean [SD] = 229  pg/mL vs 419  pg/mL, P < .05) compared with the untreated group. Secondary findings included significant improvements to NYHA CHF class (class II/III = 5/15 before treatment vs 15/5 after treatment, P < .01), weight (mean [SD] = 57  kg before vs 56  kg after, P < .05), cardiothoracic ratio (mean [SD] = 59% [1%] before vs 56% [2%] after, P < .01), and left ventricular ejection fraction (LVEF) (mean [SD] = 29% [2%] before vs 33% [2%] after, P < .05); although BP levels appeared to decrease, results did not reach statistical significance. The authors concluded that repeated FIRS treatment improved ventricular arrhythmias in patients with NYHA class II and III CHF.3 Strengths of this study included a control group that was well matched; although the study was not blinded, the control group relaxed in an environment similar to that of the FIRS (but at 24°C) for the same amount of time. All measurements taken after the intervention were performed on the day after the last treatment and can therefore be considered reliable, as this allowed adequate time for rehydration and fluid compartment redistribution. Patients in this study population, however, had asymptomatic PVCs; as such, we cannot generalize these findings to those with symptomatic PVCs, although the improvement in NYHA class is clinically relevant. Another RCT4 (level I evidence) studied 30 patients with NYHA class II or III CHF: 10 control subjects matched to 20 intervention subjects. The intervention group had 10, 15-minute FIRS treatments over a 2-week period. There were no adverse events and there were no changes in liver or renal function, electrolyte levels, or hematocrit levels. Clinical symptoms improved in 17 out of 20 patients in the intervention group and were unchanged in the remaining 3 patients. Patients’ NYHA classes improved (NYHA class I/II/III = 0/10/10 before treatment vs 1/14/5 after treatment, P = .01), as did their systolic BP (mean [SD] = 107  mm Hg before vs 97  mm Hg after, P = .02). Diastolic BP, body weight, and LVEF did not improve significantly. Brain natriuretic peptide levels decreased significantly (mean [SD] = 441  pg/mL before vs 293  pg/mL after, P < .005). In contrast, the control group did not improve either clinically or in terms of BNP levels. Endothelial function, as assessed by high-resolution ultrasound to determine endothelium-dependent flow-mediated dilation (FMD), improved with treatment (mean [SD] = 4.4% [2.5%] vs 5.7% [2.5%], P = .0006, n = 20). The authors concluded that FIRS treatment improved cardiac function and clinical symptoms in those with CHF and that this improvement was the result of improved vascular endothelial function.4 Strengths of the study were similar to those in the study by Kihara et al.3 Further, before study entry all subjects were in stable clinical condition for at least 1 month, medications had not been changed for at least 2 weeks, and adverse events were defined (dyspnea, angina pectoris, palpitations, hypotension, or dehydration). Although clinical symptoms were assessed using an unvalidated tool, it is reassuring to note the correlation between FMD improvement and both clinical and BNP improvement. In a sequential, longitudinal, interrupted time series trial5 (level II evidence), 15 hospitalized patients with NYHA class II or III CHF underwent daily 15-minute FIRS treatment for 4 weeks. Sauna treatment was safely completed without any adverse effects. Symptoms improved in 13 of 15 patients (87%); LVEF increased (mean [SD] = 30% [11%] vs 34% [11%], P < .05); every patient’s 6-minute walking distance increased (mean [SD] = 388  m vs 448  m, P < .05); and plasma epinephrine and norepinephrine concentrations both decreased (mean [SD] = 40  pg/mL vs 21  pg/mL, P < .05, 633  pg/mL vs 443  pg/mL, P < .01, respectively). Further, systolic BP and cardiothoracic ratios improved (mean [SD] = 101  mm Hg vs 98  mm Hg, 59% [7%] vs 58% [7%], respectively; P < .05 for all). Changes in weight and BNP levels did not reach statistical significance, nor did changes in NYHA class (class II/III = 3/12 vs 6/9). The authors concluded that FIRS treatment was a safe and effective adjunct therapy for CHF.5 This is the longest study of FIRS therapy for CHF; it is also the only study to document the effect of FIRS therapy on exercise tolerance. It was, however, not randomized and had a small sample size. Further, adverse events were not defined, clinical symptoms were not evaluated using validated questionnaires, and measurements were taken “immediately after” participants’ last sauna sessions. Three papers support the use of FIRS for individuals with coronary risk factors,7–9 which traditionally include hypercholesterolemia, hypertension, diabetes mellitus, obesity, and smoking. One RTC7 (level I evidence) divided 28 subjects with at least 1 coronary risk factor into 2 matched groups of 14. Group A had 15-minute daily FIRS sessions for 2 weeks, while group B rested in a room-temperature structure for the equivalent amount of time. Systolic BP was significantly reduced in the sauna group after therapy (mean [SD] = 125  mm Hg vs 110  mm Hg, P < .05) and compared with the nontreatment group (110  mm Hg vs 122  mm Hg, P < .05). Postintervention urinary 8-epi prostaglandin F2α, a marker of oxidation, decreased in the sauna group compared with presauna levels (P < .0001; unfortunately the pretreatment levels were not explicitly stated) and compared with the non-sauna group (mean [SD] = 230  vs 380  pg/mg creatinine, P < .0001). No subjects reported feeling ill during the sauna sessions. There were no reductions in body mass index, heart rate, diastolic BP, or hemato-crit, total cholesterol, high-density lipoprotein cholesterol, triglyceride, or fasting plasma glucose levels. The authors concluded that repeated FIRS therapy might protect against oxidative stress and might be a helpful adjuvant in preventing “lifestyle-related diseases.”7 The authors did not state how much time elapsed between the last sauna session and the posttreatment measurement collection. In a sequential, longitudinal, interrupted time series cohort trial8 (level II evidence), which included a non-randomized control group, 25 men with at least 1 coronary risk factor underwent 10, 15-minute infrared sauna sessions over a 2-week period. Ten additional men without coronary risk factors served as a baseline control and did not receive any sauna treatment. Systolic BP, diastolic BP, weight, and fasting blood glucose concentrations decreased (128 mm Hg vs 124 mm Hg, P < .01; 77 mm Hg vs 72 mm Hg, P < .05; mean [SD] = 75.2 [9.9] kg vs 74.9 [9.9] kg, P < .05; and 99 mg/dL vs 94 mg/dL, P < .05; respectively). Endothelial function was assessed using high-resolution ultrasound to determine brachial artery diameter at rest, during reactive hyperemia, and after sublingual nitroglycerin. Dilation during reactive hyperemia was used to assess FMD. Dilation in response to nitroglycerin was an additional control used to assess endothelium-independent vasodilation. Baseline FMD was impaired in the group with coronary risk factors (mean [SD] = 4.0% [1.7%] vs 8.2% [2.7%], P < .0001) and improved with treatment (4.0% vs 5.8%, P < .001). Endothelium-independent vasodilatation was similar at baseline between the at-risk and control groups and did not change after 2 weeks of sauna therapy. No change was seen in hematocrit, total cholesterol, triglyceride, high-density lipoprotein, uric acid, creatinine, or liver enzyme levels. The authors concluded that FIRS treatment improved impaired vascular endothelial function and suggested a therapeutic role for FIRS treatment in patients with coronary risk factors.8 Standard deviations and P values were not provided for some data reported in the study. With a standard deviation of 9.9 kg, it is difficult to see why a statistically significant decrease in weight (0.3 kg) was reported. An attempt was made to verify the P value with a statistician, but the paper did not contain sufficient data for verification. In a sequential, longitudinal, interrupted time series trial9 (level II evidence), 10 obese subjects underwent 15-minute daily FIRS sessions and followed an 1800 calorie per day diet for a 2-week period. Despite weight loss, plasma ghrelin and leptin concentrations did not change. The authors concluded, “We consider that repeated sauna therapy is useful in the treatment of obesity.”9 Could sauna treatment have blunted the response of ghrelin and leptin that one would have expected to see during weight loss? Unfortunately the study was of short duration and did not include diet-only or sauna-only control groups. Data provided in a figure imply that mean weight decreased from 83.8 kg to 82.2 kg, and states P<.05, but the actual mean and standard deviation values are not explicitly given. Concerns regarding the previous paper also apply in this study. No adverse effects were found (or reported) in any of the studies reviewed for this article. The absence of blinded placebo-control groups is a limitation of all of the studies reviewed here; however, it is not possible to have blinded control groups in studies of sauna therapy. The best studies have matched control groups that, rather than going into a sauna, went into a similar room at 24°C. In several studies, the length of time between the last sauna sessions and collection of posttreatment measurements was not stated. If measurements such as BP or weight were collected before the subjects had adequately rehydrated, then they would be artificially low, while hematology measurements, such as catecholamine, glucose, cholesterol, and triglyceride levels, would be artificially elevated. The higher-quality studies allowed 1 day for subjects to rehydrate before taking the posttreatment measurements, and also measured serum hematocrit levels as an additional measure of reassurance. In these studies there was no difference in pre-treatment and posttreatment hematocrit levels, thereby assuring us that 1 day is sufficient time to rehydrate. All of these studies are limited by small sample sizes, short duration, unvalidated symptom scales, and the fact that they were all conducted by the same core research group. Many of these studies relied on a captive (hospitalized) population and none provides any information about real-life uptake. This review is of importance to those currently suffering from—or interested in preventing—common symptoms such as pain, stress, and fatigue, as well as common chronic diseases such as hypertension, dyslipidemia, diabetes, and obesity. There is limited level I and level II evidence supporting the therapeutic use of FIRSs. There is preliminary but high-quality support of FIRS therapy for treatment of NYHA class II and III CHF and systolic hypertension, and there is fair preliminary support for its role in reducing chronic pain. There is weak preliminary support for FIRS therapy in treating chronic fatigue syndrome. There are inconsistent data regarding the effects of FIRS on weight loss, diastolic BP, and fasting blood glucose levels: some studies show benefit and others show no statistically significant benefit. There is no evidence to support the claim for cholesterol reduction; the published data have consistently found that sauna therapy does not lower cholesterol or triglyceride levels. This work was supported by the University of British Columbia’s Clinical Investigator R3 program. I also thank Dr S. Douglas, Dr J. Pawlovich, and Dr S. Pawlovich for reviewing this article. Because infrared heat penetrates more deeply than warmed air, users of far-infrared saunas (FIRSs) develop a more vigorous sweat at a lower temperature than users of traditional saunas. The cardiovascular demand imparted by thermoregulatory homeostasis is similar to that achieved by walking at a moderate pace. As such, FIRSs might be of particular benefit to those who are sedentary due to various medical conditions like osteoarthritis or cardiovascular or respiratory problems. Although the evidence is limited, it does suggest a number of benefits of FIRS use, including effects on systolic hypertension, New York Heart Association class and clinical symptoms of congestive heart failure, premature ventricular contractions, brain natriuretic peptide levels, vascular endothelial function, exercise tolerance, oxidative stress, chronic pain, and possibly weight loss and chronic fatigue. No adverse events were reported in any of the studies. All of the studies reviewed are limited by small sample sizes, short duration, unvalidated symptom scales, the fact that they were conducted by the same core research group, and the fact that many relied on captive hospitalized populations. Parce que la chaleur infra-rouge pénètre plus pro-fondément que l’air chauffé, les utilisateurs de saunas à infrarouge lointain (SIRL) transpirent plus abondamment à une température moins élevée que les utilisateurs de saunas traditionnels. La demande cardiovasculaire transmise par la thermorégulation équivaut à celle résultant d’une marche à un pas modéré. Ainsi, les SIRL pourraient être particulièrement bénéfiques pour ceux qui sont sédentaires en raison de conditions médicales comme l’arthrose ou les problèmes cardiovasculaires ou respiratoires. Quoiqu’en nombre limité, les données probantes suggèrent un certain nombre d’avantages à l’utilisation des SIRL, incluant des effets sur l’hypertension systolique, la classe et les symptômes cliniques de l’insuffisance cardiaque, les extrasystoles ventriculaires, le niveau du peptide natriurétique cérébral, l’activité vasculaire endothéliale, la tolérance à l’exercice, le stress oxydatif, la douleur chronique, et peut-être la perte de poids et la fatigue chronique. Aucune des études n’a signalé d’effet indésirable. Toutes les études révisées sont limitées par la petite taille des échantillons, des courtes durées, des échelles de symptômes non validées, le fait d’avoir été effectuées par le même groupe de chercheurs et le fait que plusieurs dépendaient de populations hospitalisées captives.